The creative cakes featured below are my top 10 favorite crawfish boil cakes. And YES they are all cake even though they may look too real to be edible! Either served at a traditional crawfish boil as a crawfish themed dessert or highlighted at a Louisiana Cajun themed wedding or party, these elaborate cakes are fabulous. I hope these photos offer some inspiration to you for your next Louisiana themed party. 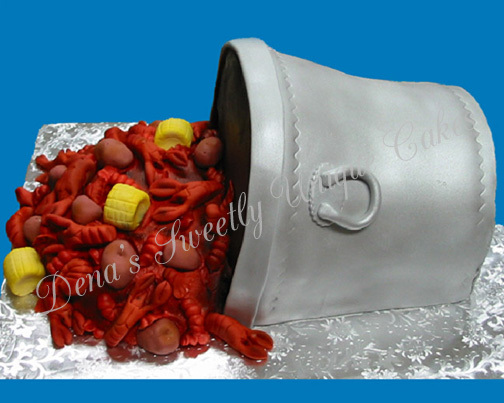 A crawfish themed cake is sure to be a crowd stopper! WOW...What a delicious looking crawfish boil pot? Those creamy mushrooms look perfect scattered around the pot. The spicy boiled mushrooms are one of my favorite things to eat at a crawfish boil! Aryanna Gamble at The Crumby Baker posted this crawfish boil cake on her blog. After years of putting off trying all those new recipes she collects, Aryanna instituted CAKE MONDAY and chronicles her adventures on her delightful blog. Here is what she had to say about this crawfish boil cake creation, "So my friends and I annually overindulge ourselves in the bliss that comes every spring in New Orleans--Crawfish Season. What better accompaniment than an overindulgent, overambitious 7 layered chocolate cake? According to everyone in attendance, none! It was the hit of the party, which made me feel oh so much better about spending 2 weeks of planning and 1 week of production on this bad boy." Aryanna Gamble gives you all the "how to" details of this perfect cake as well as lots of great cake decorating tips at Crumby Baker. Check out her insightful commentary and other creative cakes on her blog. That is one big crawfish! 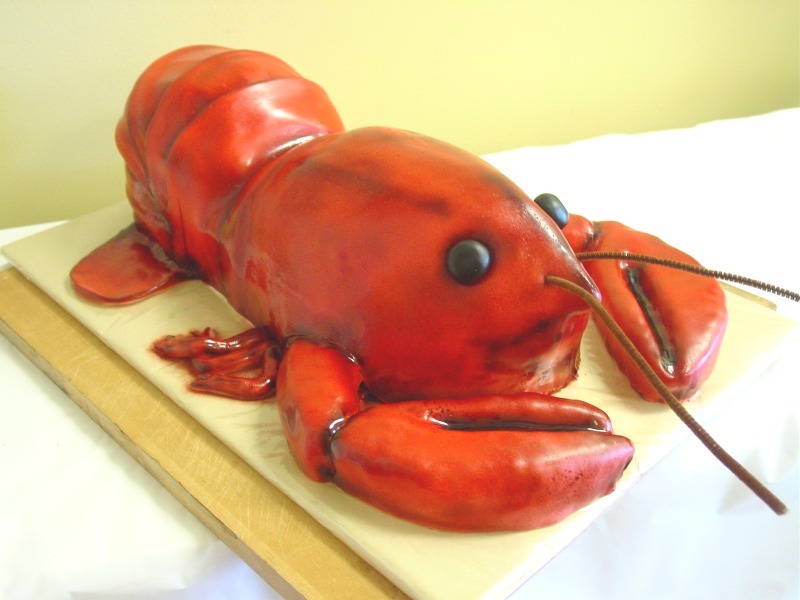 I think this giant crawfish cake is so realistic and almost too cute to eat. Wonder if this crawfish is spicy like its boiled crawfish cousin? 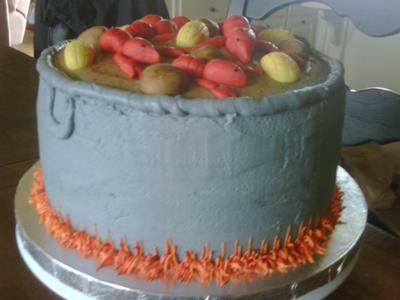 This version of a Crawfish Boil cake was made for a crawfish boil birthday party. 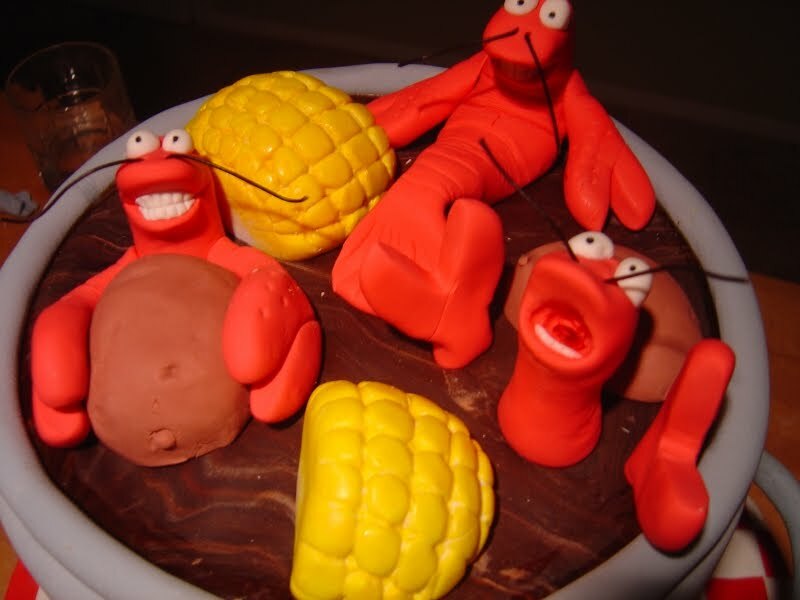 The crawfish, corn, potatoes and lemon are marshmallow fondant. The "pot" is a 4-layer yellow cake with butter cream icing. Amy of Custom Cakes by Amy says,"I had a lot of fun with this one." I bet it was just as fun to eat!Check out Amy's blog for more photos and information on this creative cake. 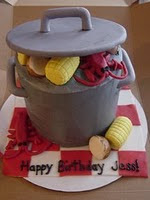 This fun 35-count cupcake cake is complete with crawfish, corn, potatoes, and beer cans all made of fondant. The top is iced in butter cream and airbrushed to look like a picnic tablecloth.The cake board is covered in newspaper, like the table at a real crawfish boil. What a great authentic twist the newspaper adds to this cupcake crawfish creation! Cupcake cakes are so popular right now. This one is sure to be a hit for a crawfish boil. 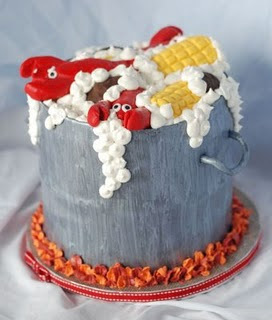 This elaborate Crawfish Boil cake was posted on Laurie's Blog. This was the groom's cake at a Louisiana themed wedding. The photo was sent to her, but she does not know who created the cake. I would love to know who made it. If you know, please respond in the comments. The details in this cake are amazing. The groom must have loved boiled crawfish and I am sure this cake! What great attention to detail there is in this crawfish boil cake. I like the multi-colored flames and cute bubbles of boiling foam. The attention to detail goes all the way down to the sweet, simple ribbon around the cake board. I can not find the information on who made this cake. If you know where to credit this cake, please let me know! This cake is by Wendy Averett who has dreams of opening up her own bakery. This single mom of two currently bakes cakes out of her home for lucky friends and neighbors. This crawfish boil cake is a testament to her talent. I hope she gets her bakery soon! Dena Bryngelson of Dena's Sweetly Unique Cakes creates this Crawfish Boil cake as a Groom's Cake for those southern men who love boiled crawfish. I like Dena's interpretation with the pot spilling out onto a table...just like a real crawfish boil. You can almost see the steam coming off the pot. Check out Dena's website for other unique cakes. 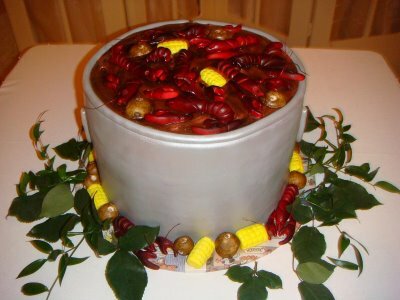 This unique take on a Crawfish Boil cake shown here was submitted to Cake Central by the Cake Girls. The animated crawfish on this cake look like they are enjoying a pool party in that crawfish pot complete with pool floats and beer. From the look of the flames on the bottom, it is going to get hot quick! 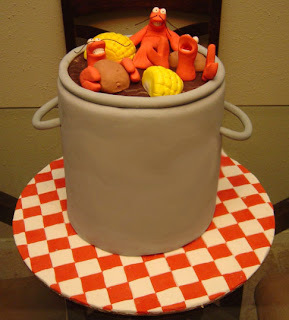 This whimsical cake with animated crawfish in a hot pot caught my eye. 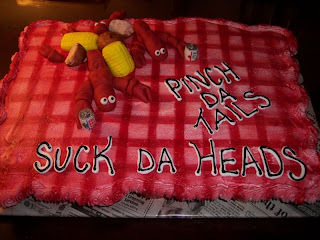 This cake posted by Sugar Daddy Bakery is if full of crawfish personality. Check out the faces of those crawfish! They look like little perfect animated figurines, not edible parts of a cake. The baker of this cake wrote that this was his first cake...he is full of talent. Keep up the good work! Check out his web site for more information on his work. 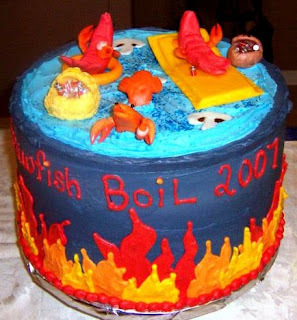 Hope these pictures inspired you to bake or order one of these fun cakes for your next crawfish boil. 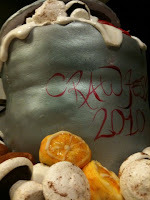 A crawfish themed cake is a great way to end a spicy crawfish boil on a sweet note!